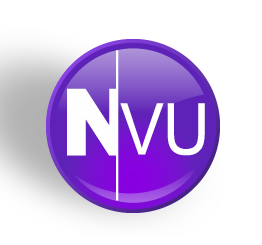 Nvu allows you to edit multiple documents at the same time. Rather than to shift from one window to another for editing more than one document, Nvu offers the feature of Tabs. More than one document can be opened at the same time with Nvu in the same window but in different tabs. Tabs can be opened using either Ctrl+T or by choosing Create in: New Tab in the New file open dialog. Even with multiple tabs open, each is handled independently. Each document's state is indicated, i.e. if it is modified and needs saving by a red-floppy icon on the corresponding tab.